Dimensions : 1100 mm high, 580mm wide, 420mm deep. Weight 29kg. Microphone length 470mm, Lamp length 450mm. 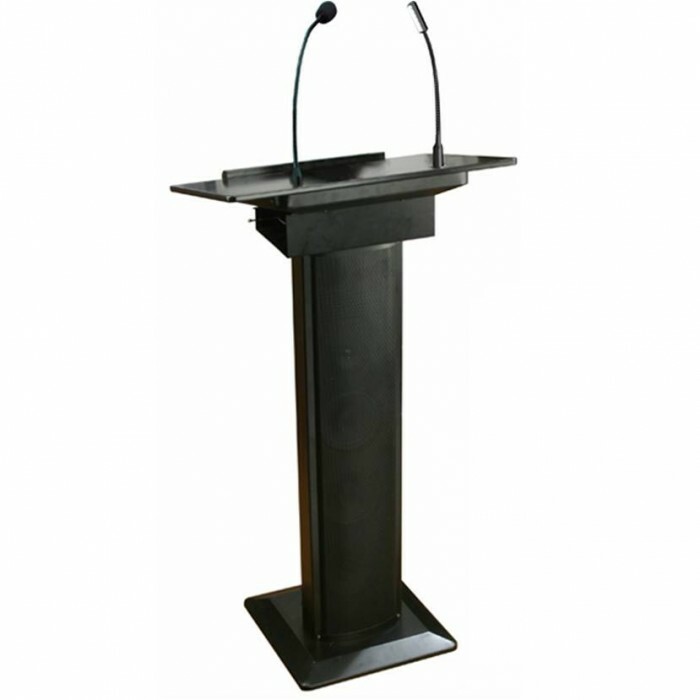 Features : This Lectern is an attractive all-in-one public address sound system - sleek looking, with powerful, clear sound. - It couldn’t be simpler to use - it has a built in 60w amplifier and column speaker, and is supplied with a flexible gooseneck microphone and gooseneck lamp for the reading surface. - A number of input and output connections make it easy to expand its capacity with line-in for ipod or laptop sound, and line-out so you can connect to other amplifiers and speakers if you need to cover a larger audience or record the meeting. - Four speakers are mounted in the vertical column and the volume controls are conveniently located within easy reach on the rear.